Medirox APTT liquid reagent is used for in vitro determination of the Activated Partial Thromboplastin Time (APTT). APTT is measured to obtain a global evaluation of the intrinsic pathway and for monitoring heparin anticoagulant therapy. 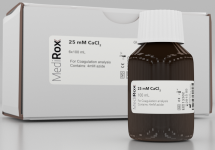 The Medirox APTT reagent has been designed to provide an extra long reaction time in order to obtain a high resolution for clearest interpretation of results. Activated partial thromboplastin time (APTT) is a commonly used screening test for haemostatic defects in the intrinsic and common pathway of the coagulation cascade, as well as the contact activation system. Thus, FV, FVIII, FIX, FX, FXI, FXII, prekallikrein and high‐molecular weight kininogen deficiencies can result in a prolonged APTT. Moreover, APTT is also suitable to monitor heparin treatment and, depending on the design of the reagent, for detection of lupus anticoagulant (LA). Since there is no international standard for APTT to correlate against, each APTT on the market has its own composition of phospholipids and activator, giving reagents different characteristics. MRX APTT can be characterised as heparin, FVIII, FIX, FXI sensitive, while still being insensitive to presence of LA, since LA can cause a falsely pro-longed APTT. Thus it is suitable to monitor heparin treatment and for haemophilia screening, while less suitable to detect LA. MRX APTT reagent utilises a near colloidal contact activator to stimulate generation of FXIa by providing a surface for the interaction of high molecular weight kininogen, kallikrein and FXIIa. The contact activation is allowed to proceed at 37 °C for a period of time before calcium chloride is added to trigger further reactions and finally a formation of fibrin clot. MRX APTT reagent contains phospholipids and silicate to ensure a highly consistent and stable product. The product is designed to be insensitive to LA and to have high sensitivity to heparin.